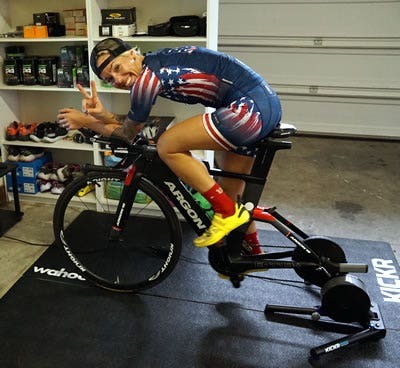 Three-time Wildflower Triathlon Champion and Ironman World Championship Podium finisher, Heather Jackson, is a tough competitor with no patience for excuses. In her first full season as an amateur triathlete, Jackson qualified for and won the Ironman World Championships in Kona in her age group. She then turned pro at the end of 2009, and through hard work and her aggressive racing style, Jackson has caught the eye of the media and gained an impressive fan base that is addicted to her positive outlook on sports and life. We're proud to have her using the full-line up of Wahoo products in 2018. "Now Wahoo has the BOLT, which is so incredible...am I allowed to have a favorite product? They have thought of everything with the BOLT. It's so easy to use, with clear, visible imagery of all the data you might want to have in front of you. The data it provides you after a ride on the app is so awesome- colorful, detailed graphs of, literally, EVERYTHING. The BOLT pops up any text messages you receive while you are riding, which is awesome in case someone has been dropped, is lost, there is an emergency at home, or whatever else, you don't have to stop and pull out your phone- you will get the notification immediately right in front of you. The Wahoo app that goes with the BOLT allows you to live track where you are and so your friends and family members can see exactly where you are while you are out training in case something were to happen or they needed to find you immediately." "The Wahoo KICKR was the first product I used and it was so awesome! This was years ago too - so it was before more of the smart trainers came out. Wahoo was ahead of its time in allowing cyclists to have power for training if you couldn't afford or didn't have a power meter on your actual bike. Not only did they bring power but in a fun way and with an app that allowed you to set power zones, or set up workouts, or control whatever you needed for your training." "To go with their products, they had all the little things you could use to help monitor and track your progress - HR monitor and a cadence sensor so you can track everything." My team and I put everything we can towards becoming better each day - we leave no stone unturned. We like to think outside the box on training techniques and push boundaries on the day-in-and-day-out hard work. We look for tools to help us on this journey to become the best and years ago, when Wahoo was just putting out some of its initial products, I wanted to use them and be involved. The branding is super cool, the products are the best out there, and each new tool coming out is better and better. For me, it's an absolute honor to officially be a Wahooligan. I would consider getting on the podium (3rd place) at the Ironman World Championships in 2016 as my greatest accomplishment. I've gotten 5th (2015), 3rd (2016) and 4th (2017) at the Ironman World Championships. I also consider winning Escape from Alcatraz (2013) a pretty big accomplishment since that isn't really a race suited for me considering the swim, hehe. I also think winning Wildflower Triathlon 3 years in a row, and winning and breaking the course record at Ironman Lake Placid (2016) stand out for me. 1. Consistency- if you have time restraints, even if you can just get a 20minute jog or half-an-hour swim in each day, day after day, that consistency will show results over just 2 bigger days each week. 2. Keep it fun- triathlon is such a lifestyle sport. Hypothetically, you could participate in this sport your entire life, so make sure you keep it fun. It can be so easy to burn out on the same stuff every day, week after week, and year after year. Find friends to train with, find swim groups, plan some fun destination races...weave the sport into your lifestyle and you will get so much more out of it. 3. Every session is not the end all- if you don't hit a session exactly as prescribed, it's not the end of the world. My first few years in the sport, I used to get so upset if I couldn't hit the specific mile repeat times or the watts I was supposed to hit on my bike. I thought that I was getting worse because of that one day. Use the sessions you struggle on as indicators for what's going on in that training block- maybe you are tired, maybe the session the day before affected it....just make sure you see each session within a bigger picture and not just as a stand-alone training session that indicates anything regarding how you might do in an upcoming race. I feel so lucky and am so grateful to get to do this as a profession, so for me, I am motivated every single day to get out there and try to get better and better. I feel like I have so much room for improvement in this sport, especially having come into later than other athletes I race against. So everyday I am motivated to get better, knowing that I could very easily be sitting at a desk job and not have this opportunity, so I NEVER take that for granted. I'm also a naturally innate competitive person. I want to be the best in the world- I want to win the Ironman World Championships and I am motivated to try and do that. My biggest inspiration comes from my family- my Grampa is 92 years old and still works. He was a mason his entire life and has basically built all of the stone buildings in my hometown (Exeter, NH). He still mows lawns, fixes stone walls and helps friends out around our town. He survived WW2 and has the funniest stories to tell. He and my two parents who worked about 3 jobs each my entire childhood to put me and my 3 siblings through school, on all of the different sports teams we played on, put food on the table, etc. inspire me everyday. My parents taught me hard work and about earning whatever it is you want- nothing is just handed to you. So that is what inspires me to work hard each day- because they worked hard for me. I love EVERYTHING about Wahoo! Initially, the name and the branding draws you in. It's cool, fun, engaging...it makes you want to know exactly what it is this company is making. The people behind Wahoo have thought of everything in terms of tools that can provide data that can help you become a better athlete and are delivering products that are cool and super fun to use.